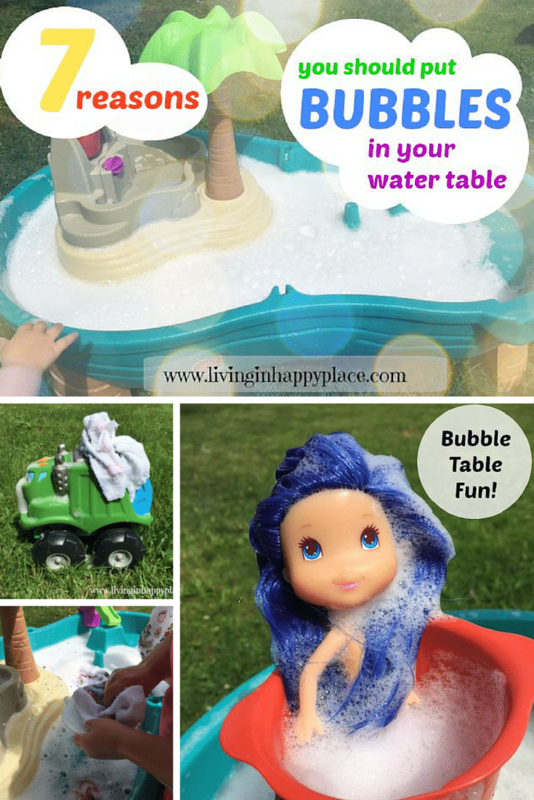 Preview: The best water table activity idea for kids included lots of bubbles for sensory play! Take water play to the next level! This easy water table activity is perfect for toddlers, preschoolers, or any kid who loves water (and bubbles!). 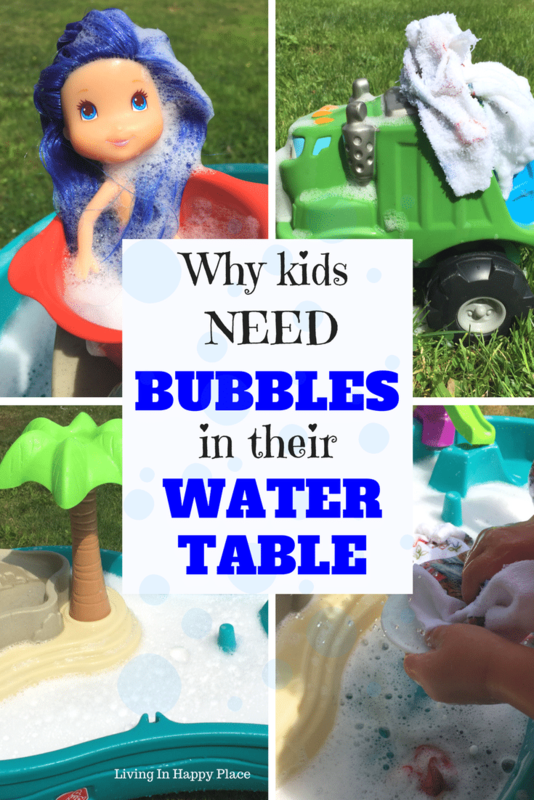 Adding bubbles to your kids’ water table is a great sensory activity for outdoor play. What is the best water table for kids? How many times a day do you hear “I’m bored”? It feels like 1,000 times (especially in the summer!) 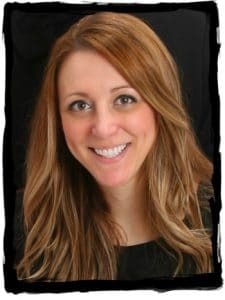 It’s hard to imagine how my kids get bored when they have SO many toys that I had to make a play schedule and create a list of places to donate old toys. The water table was awesome for about a week and then it became a lawn ornament (sound familiar?). One of the ways I try to keep the novelty of toys from wearing off so quickly is to repurpose them. So one afternoon while I am juggling being a stay-at-home and work-from-home Mom, I tried this activity to keep my kids entertained. It kept them busy for over an hour (which is quite a task with 2 toddlers)! I really enjoyed watching them play happily and it inspired this list. I hope you can appreciate my “mom” humor and see the serious reason why bubble in the water table turned out to be a fantastic idea! 1.It’s hard to get a spa appointment- Apparently Strawberry Shortcake’s friend, Blueberry, needed a spa day. She got a shampoo and rinse along with her “relaxing” bubble bath. I believe Barbie is still on the waiting list for an appointment. 2. Toy trucks can’t get to the car wash- Who wants to wait in line at the expensive car wash? 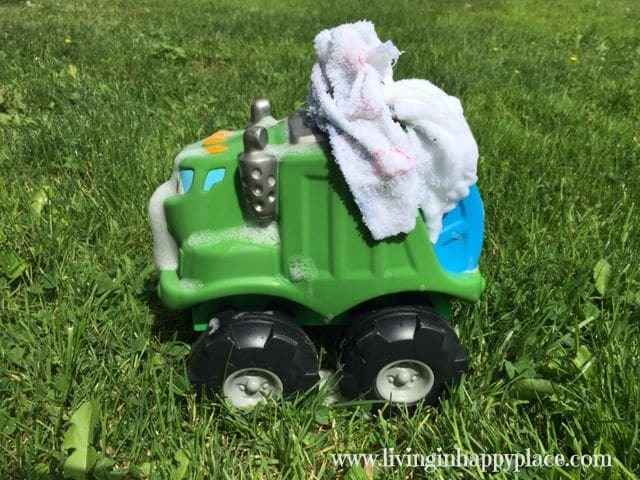 Toy cars can get the VIP treatment right in the backyard with some bubble bath and an old dish rag. 3. Learning to wash the dishes is a valuable life skill– The earlier kids develop a love of dish washing; the better it will be for everyone. (It is also a good fine motor activity- see #7). 4. Mom has some gardening to do- and her tomato plants can’t handle another game of “Big Foot”. 5. Bath time can be such a fight– Suds them up, rinse them off. Bath time: Done. (I’m half joking here people). 6. 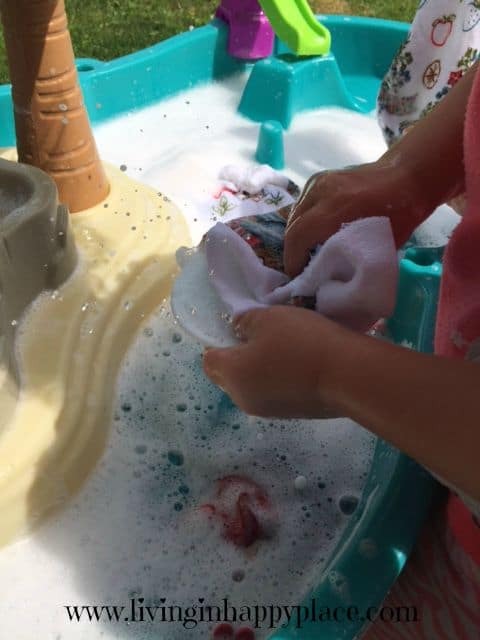 Bubbles and water play are great sensory activities– Sensory play helps children make a connection between words and meanings. Telling a child/toddler/baby “bubble” doesn’t mean much to them. Telling them “bubble” and then letting them experience the feel of bubbles, the texture, the temperature, etc. helps them understand what a bubble actually “is”. Children learn through their senses (a huge part of the reason babies put everything in their mouths). This is an excellent activity to allow children to learn through sensory play. 7. They are developing fine motor skills– In short, fine motor skills involve the use of the smaller muscles of the body. Skills such as pinching and grasping improve these muscles in children. Developing these muscles now helps later with writing, computer use (they are the future of the information age), their ability to dress themselves, and hopefully their skilled use of medical instruments (because they are all going to be doctors, right?!). In all seriousness, activities such as washing dishes and grasping toys build important fine motor skills. Bonus reason!- Childhood is short. You hear it all the time, but it is not until you see your own child do it that you get the full meaning of the phrase “they grow up so fast”. Letting them play and enjoy being carefree is just as important for them as it is for their adoring, tired parents. So my last point is for you: enjoy watching your kids play in the bubbles of childhood! When they are done playing water table, teach them these 15 “old-school” outdoor games that you used to play as a kid! Yep. Gross. 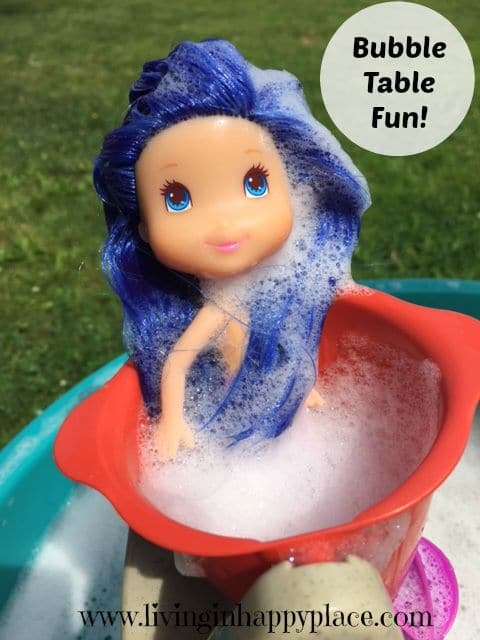 Here are some tips on keeping water toys clean. It has now lasted through 3 kids. Every spring I use a Magic Eraser to wipe it down and it’s almost like new.